Thermodynamics is a branch of physics which deals with the energy and work of a system. It was born in the 19th century as scientists were first discovering how to build and operate steam engines. Thermodynamics deals only with the large scale response of a system which we can observe and measure in experiments. Small scale gas interactions are described by the kinetic theory of gases. The methods complement each other; some principles are more easily understood in terms of thermodynamics and some principles are more easily explained by kinetic theory. There are three principal laws of thermodynamics which are described on separate slides. Each law leads to the definition of thermodynamic properties which help us to understand and predict the operation of a physical system. We will present some simple examples of these laws and properties for a variety of physical systems, although we are most interested in thermodynamics in the study of propulsion systems and high speed flows. Fortunately, many of the classical examples of thermodynamics involve gas dynamics. Unfortunately, the numbering system for the three laws of thermodynamics is a bit confusing. We begin with the zeroth law. The zeroth law of thermodynamics involves some simple definitions of thermodynamic equilibrium. Thermodynamic equilibrium leads to the large scale definition of temperature, as opposed to the small scale definition related to the kinetic energy of the molecules. The first law of thermodynamics relates the various forms of kinetic and potential energy in a system to the work which a system can perform and to the transfer of heat. This law is sometimes taken as the definition of internal energy, and introduces an additional state variable, enthalpy. The first law of thermodynamics allows for many possible states of a system to exist. But experience indicates that only certain states occur. This leads to the second law of thermodynamics and the definition of another state variable called entropy. The second law stipulates that the total entropy of a system plus its environment can not decrease; it can remain constant for a reversible process but must always increase for an irreversible process. An important property of any gas is temperature. We have some experience with temperature that we don&apos;t have with properties like viscosity and compressibility. We&apos;ve heard the TV meteorologist give the daily value of the temperature of the atmosphere (15 degrees Celsius, for example). We know that a hot object has a high temperature, and a cold object has a low temperature. And we know that the temperature of an object changes when we heat the object or cool it. Scientists, however, must be more precise than simply describing an object as "hot" or "cold." 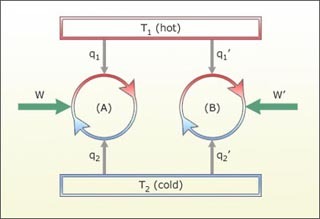 An entire branch of physics, called thermodynamics, is devoted to studying the temperature of objects and the transfer of heat between objects of different temperatures. We are including some fundamentals of thermodynamics in the Beginner&apos;s Guide to help you better understand propulsion. We are also including an interactive simulator to let you study how temperature varies with height through the atmosphere. There are two ways to look at temperature: (1) the small scale action of individual air molecules and (2) the large scale action of the gas as a whole. Starting with the small scale action, from the kinetic theory of gases, a gas is composed of a large number of molecules that are very small relative to the distance between molecules. The molecules are in constant, random motion and frequently collide with each other and with the walls of any container. The molecules possess the physical properties of mass, momentum, and energy. The momentum of a single molecule is the product of its mass and velocity, while the kinetic energy is one half the mass times the square of the velocity, as shown on the left of the above figure. For diatomic gases like oxygen and nitrogen, in which the molecules are composed of pairs of atoms, energy can also be stored in the vibration and rotation of the atoms about each other. The temperature of a gas is a measure of the average translational kinetic energy of the molecules. In a hot gas, the molecules move faster than in a cold gas; the mass remains the same, but the kinetic energy, and hence the temperature, is greater because of the increased velocity of the molecules. The first principle is the observation that the temperature of an object can affect some physical property of the object, such as the length of a solid, or the gas pressure in a closed vessel, or the electrical resistance of a wire. You can explore the effects of temperature on the pressure of a gas at the animated gas lab. The second principle is the definition of thermodynamic equilibrium between two objects. Two objects are in thermodynamic equilibrium when they have the same temperature. And the final principle is the observation that if two objects of different temperatures are brought into contact with one another, they will eventually establish a thermodynamic equilibrium. The word "eventually" is important. Insulating materials reach equilibrium after a very long time, while conducting materials reach equilibrium very quickly. With these three thermodynamic principles, we can construct a device for measuring temperature, a thermometer, which assigns a number to the temperature of an object. When the thermometer is brought into contact with another object, it quickly establishes a thermodynamic equilibrium. By measuring the thermodynamic effect on some physical property of the thermometer at some fixed conditions, like the boiling point and freezing point of water, we can establish a scale for assigning temperature values. There is a similar absolute temperature corresponding to the Fahrenheit degree. It is named after the scientist Rankine and designated with an R.
Absolute temperatures are used in the equation of state, the derivation of the state variables enthalpy, and entropy, and determining the speed of sound. Temperature, like pressure, is a scalar quantity. Temperature has a magnitude, but no direction associated with it. It has just a single value at every location in a gas. The value can change from location to location, but there is no direction connected to the temperature.